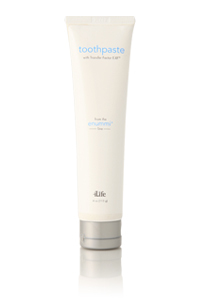 4Life Transfer Factor Toothpaste offers the benefits of 4Life Transfer Factor E-XF™ and other ingredients, including Coenzyme Q-10 and lactoferrin, to promote healthy teeth and gums. 4Life Transfer Factor E-XF helps promote the health of your teeth and mouth. Xylitol is a sweetener with antibacterial qualities that helps inhibit the bacteria associated with plaque and tooth decay.